Simon Cowell has described his fallout with Cheryl Fernandez-Versini as a 'nightmare' ahead of the UK X Factor return. Cheryl and Jean-Bernard Fernandez-Versini threw a party in London to celebrate their wedding. Their close friends and family attended including Cheryl's Girls Aloud band mates Nicola Roberts and Kimberly Walsh, JLS star Marvin Humes and his wife Rochelle from The Saturdays, and Cheryl's mother Joan. Cheryl has recently tied the knot with French restaurateur Jean-Bernard Fernandez-Versini. It was reported that only four people attended the ceremony at the Caribbean island of Mustique. 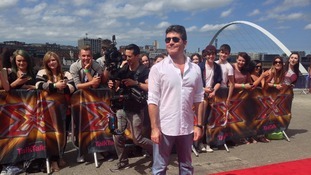 To make up for this, the Geordie X Factor judge threw an exclusive Party in London. Cheryl wore a floor-length black gown at the Library were her Girls Aloud friends Nicola Roberts and Kimberley Walsh partied with her mother Joan Callaghan. Cheryl's step-father: "It is a bit of a surprise"
Cheryl Cole's step-dad said the news she is married has come as a 'right surprise'.The 31-year-old X Factor judge has announced she secretly married French boyfriend Jean-Bernard Ferdandez-Versini a week ago.Speaking from his house in Walker, her step-dad Anthony Leighton said he is happy for her. "If she's happy then I'm happy. "She's lovely and I am really happy for her. "I found out through Facebook, she doesn't bother with us much. She phones her sister and she phones her brother sometimes but what we hear is just back and forward. "It is a bit of a surprise for everyone. I'm pleased for her." As Cheryl announces she is a married woman following a secret ceremony to her French boyfriend, fans ask - will Cheryl drop Cole? X Factor's announcer guy currently practising "Cheryl Fernandez-Versini!" in his bathroom. He's not happy. Haha as if Cheryl Cole's gotten married.. Wait why is she still known as Cole? ? Cheryl Cole married her French boyfriend of three months last week in the Caribbean, the singer and TV star confirmed. The X Factor judge made the announcement with a picture on her Instagram account, showing the wedding and engagement rings new husband Jean-Bernard Fernandez-Versini had given her.